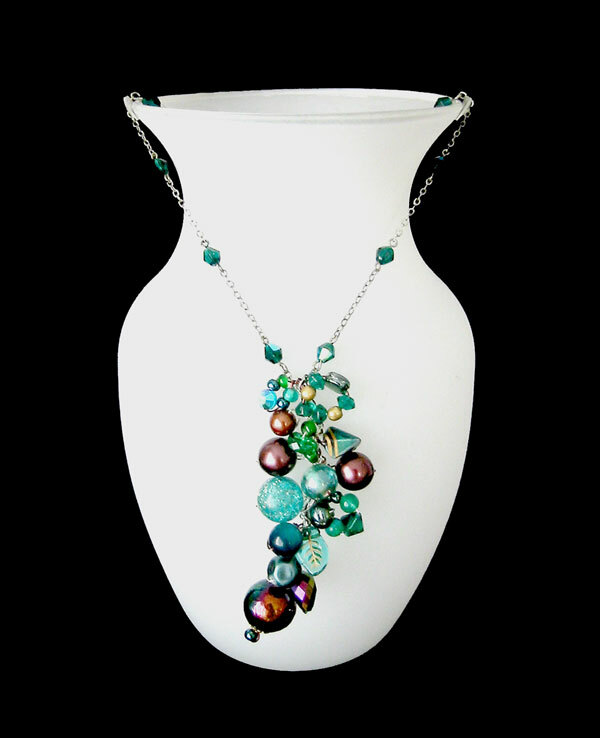 Chain Length: 28" - Pendant Length: 3"
Vintage Czech Silver Plated Chain with emerald/Aurora Borealis bicones & hematite Lobster Claw Clasp. Very vintage handmade glass 'petrol'' round, probably Venetian, with original brass beadcaps. Vintage Lucite round with silver glitter inclusions. Vintage molded acrylic Vitrail/Aurora Borealis faceted teardrop. Vintage emerald green Lucite 'moonglow' round. Vintage Swarovski Blue Zircon/Aurora Borealis crystals. Antique Sandwich Glass emerald seed trade beads with white cores. Tiny vintage glass Blue Zircon bicones. Vintage emerald glass facet-rimmed rondelle.